MAYFIELD TWP. — Matt Zeeman and Kyle Muxlow were only 24 when they became proud new business owners. 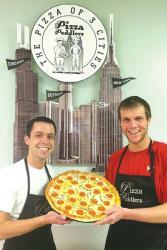 Their business, The Pizza Peddlers, offers fast, gourmet pizzas made to order with clean, friendly service. The two Lapeer East graduates took over space in the Marathon station at Sawdust Corners and M- 24, cleaning and renovating the space to transform it into a pizza parlor. Zeeman said it took a lot of work to bring it up to his standard of cleanliness, but knew that it would be worth it for his customers. Zeeman is no stranger to the location at Sawdust Corners either. He has worked for the gas station owners, Mike and Anthony Zetouna, for the past six years. He said he saw the need for good pizza in the area, and when the space became available he jumped at it. Zeeman is proud to announce the new pizza parlor is nothing like what had been there before, adding previous pizza makers at the location did not keep the area clean, and their product was, in his mind at least, very sub-par. “Kyle and I really take pride in what we’re doing here and for the community,” he added, saying that they understand the importance of cleanliness and presentation along with flavor and taste in any restaurant business. The Pizza Peddlers will be focusing on making “fast, delicious, gourmet-style pizzas” along with salads, subs, and newly added grinders. The Pizza Peddlers uses all fresh, locally grown produce on their pizzas as well. “We’re trying to stay local with it,” said Zeeman. Hours of operation are from 11 a.m. to 9 p.m. Sunday through Thursday and 11 a.m. to 10 p.m. on Friday and Saturday. Pizza Peddlers can be reached by calling 810-245-5515.